History: (West Coast Avengers II#24 (fb) - BTS) - The Desert Dwellers were created by Dominus in order to deal with any superhuman foes he might have to contend with on Earth while he prepared to unleash devices which would subjugate humanity. Based in Arizona, Dominus expected to encounter the Defenders or Rangers, or the X-Men, old enemies of his people, and sent the Desert Dwellers out to spy on them. 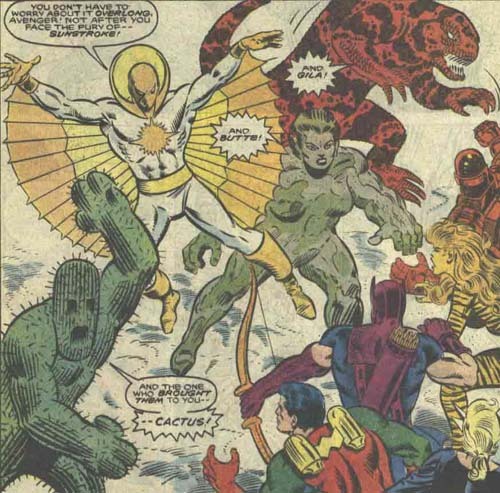 (Marvel Tales I#262/2) - Sunstroke set out to his powers to bring down commercial aircrafts in the desert, but met his match when he brought down a plane flown by the X-Men. Outmatched by the X-Men, the other Desert Dwellers came to his rescue, and Butte enabled him to escape by covering him with her body, making it appear as though the earth had swallowed him up. (West Coast Avengers II#17) - When the West Coast Avengers came near Dominus' base, Cactus spied upon them, and brought the other Desert Dwellers to confront them. When they were defeated, Dominus caught them in a force field and returned them to their base. When the Avengers followed them into the base, Dominus caught them in Dr. Doom's time machine, and sent them back in time 100 years. (West Coast Avengers II#22 - BTS) - Concerned that the Avengers might be rescued by the Fantastic Four's time machine, Dominus sent the Desert Dwellers to Four Freedoms Plaza. They fought their way past the Fantastic Four, and destroyed their copy of Dr. Doom's time machine. (West Coast Avengers II#24) - When the Avengers returned from their trip in time, accompanied now by Espirita, Moon Knight and Henry Pym, they returned to Dominus' base, only to face an army of duplicated Gilas, Cacti, and Buttes, numbering 50 altogether. Regardless, they managed to fight their way through the creatures, and Dominus ultimately fled Earth. (Avengers Spotlight#26/2) - One of the Cacti was revealed to have been incarcerated at the Vault. Although the Wizard was able to engineer a break-out at the Vault, the Cactus was not among those who escaped. Comments: Created by Steve Englehart, Al Milgrom and Joe Sinnott. Considering that Dominus had created the Desert Dwellers to face the X-Men, the Marvel Tales back-up story is a terrible waste. The only thing of interest is that the Desert Dwellers received their group name there. Butte was a rock-like creature designed by Dominus. Over a dozen different Buttes were known to have existed at one point, but many of them were destroyed by the Avengers. Each Butte possessed superhuman strength and the ability to shift their bodies into surrounding rocks. Cactus was a cactus-like creature designed by Dominus and consisting entirely of pulp. Over a dozen different Cacti were known to have existed at one point, but many of them were destroyed by the Avengers. Each Cactus could fire needles from its body, and regrow severed limbs. At least one Cactus was later incarcerated at the Vault. The Avengers never considered Cactus a serious threat, kidding it with the line "stick around." Gila was a gila-like creature designed by Dominus. 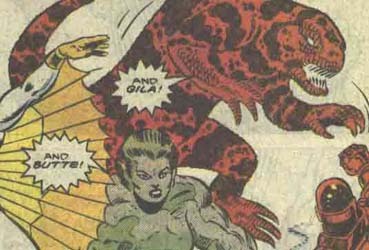 Over a dozen different Gilas were known to have existed at one point, but many of them were destroyed by the Avengers. Each Gila possessed sharp teeth, enhanced agility, and a tail it could use in combat. Because gilas use their nose instead of eyes to sense, Gila was extremely sensitive to smell-based attacks.